She/He Loves DC is a series highlighting the people who love this city just as much as we do. Don Michael Mendoza is charismatic. By day Mendoza works with VIDA Fitness flexing the communications skills he obtained at DC’s American University. By night he’s an actor who performs all over the greater-DC area while working with a wide array of theater companies including brief stints in New York for various creative projects. He’s also been able to channel that charisma into creating something he believes DC had been lacking – a musical theater cabaret and spoken word series. 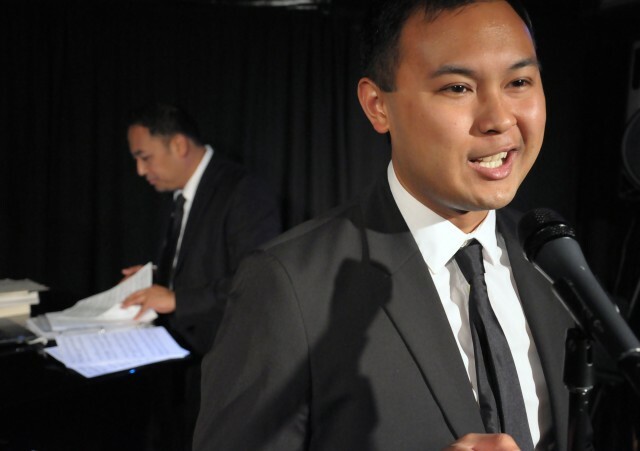 Mendoza co-founded and now co-hosts the award-winning weekly series La-Ti-Do at Black Fox Lounge in Dupont Circle with friend Regie Cabico. The pair established the idea in the fall of 2011 before launching the series in its official capacity in January 2012. Ever since then, the show’s audience continues to grow and the night-of talent is of the highest caliber available. Mendoza takes immense pride in being able to provide this type of creative outlet for both audience members and performers alike. So if you find yourself at a La-Ti-Do performance, just know that what you’re seeing is most certainly a labor of love. What is it about DC that makes it home to you? DC was where I was born and lived before my family moved to Pittsburgh when I was 4. However, we always made trips here often because we have a lot of family friends here, so it’s really an extension of my hometown. I officially made my return here in 2006 when I attended American University where I was able to get my own feet planted here and staying here after graduation was the natural choice for me. Describe your perfect day in DC. Where would you go and what would you do? “My perfect day would be April 25th because it’s not too hot and not too cold. All you need is a light jacket.” Kidding! Actually it would really be in the early fall, say September, eating on an outdoor rooftop somewhere in the sun with a few good friends. Especially because my birthday is also in September, so I am always drawn to fall in DC. What’s your favorite hidden gem of a location in DC? How did you find it and why do you love it? My favorite spot is at the Black Fox Lounge, not just because I host my cabaret series, La-Ti-Do, there but also because the vibe is really laid back and classy at the same time. It’s a place where I know I can relax and the fact that I can practice my art there is an added bonus! I found it through my good friend Regie Cabico who introduced me to the owner and the venue when we were in the early stages of establishing La-Ti-Do. Who’s your favorite DC personality and why? My favorite DC – and national – personality would be Diane Rehm at 88.5 WAMU. I interned for her while I was in school and the experiences I gained with her and her staff were invaluable as a young broadcaster turned show host. I met so many interesting personalities from Carrie Fisher to President Jimmy Carter, but Diane herself is such a gracious person and she was always there to set a great professional example for me. What spurred your decision to co-found and co-host a musical theater cabaret and spoken word series in DC and what do you think the support La-Ti-Do’s received says about the arts scene in this city? Since we launched in January 2012, we’ve received an overwhelming amount of positive feedback from members of the theatre and spoken word communities along with generous reviews from the artistic media which only tells us that La-Ti-Do was something that the community didn’t have and urgently needed. The idea of La-Ti-Do, or what was originally named ManiLa-Ti-Do, because me and my co-host are Filipino, came to be in the fall of 2011 after I met my co-founder, Regie Cabico, that summer. My background is primarily in musical theatre and his is in both musical theatre and spoken word. As a newbie in the theatre community who was not blessed with the benefit of knowing a lot of people in “the business,” I wanted to start something that I could call my own and have it be something that could assist me in making an impression on the community to hopefully lead to more opportunities. Regie wanted to create something that combined his two passions, but was looking for someone who was willing to take the risk on a never-before-seen project in Washington, DC’s arts scene: a weekly, curated, high-quality musical theatre and spoken word cabaret series that was actually affordable for a majority of patrons. Cabaret and spoken word performances are in New York City on a frequent basis, but in DC, it is not really a common occurrence outside of TheatreWashington and Busboys & Poets. We’ve found that anything that gains success in a given community is something that fulfills a need; and that need was a regular cabaret show that would help reignite the cabaret conversation in Washington, DC. This inspired me and Regie to create a regular performance opportunity in the theatre and spoken word worlds. One that performers who are in their prime – both amateur and professional – can come in and be part of a group of high-caliber artists and network amongst each other and perform for an audience that expects high quality product for only $10. Today, we are reaching our 18-month milestone in DC and celebrating new initiatives such as our second chapter in New York City that launched on June 9, 2013, our Monthly Artist-In-Residence program premiering with the talented group named Liberated Muse, and our first musical production in the Capital Fringe Festival called LOVE, NY. Each of these initiatives is fueled by the passion of our many performers we call La-Ti-Do Alumni who reside all over the continental United States, Canada and the UK.